Holiday greetings to everyone. At least two local Gainesville eateries are now on Twitter (who isn't these days?!? ): Adam's Rib Co. and The Wine & Cheese Gallery. Adam's started following me on Twitter this past week. It looks like they also have a new site up. Here's the Twitter feed for Adam's Rib Co. and here's the Twitter feed for The Wine & Cheese Gallery. (Check out my previous review on Panache, the little lunch spot tucked into the back of The Wine & Cheese Gallery). It will be interesting to see how Adam's uses Twitter (hmm...free ribs to your 100th follower?). The Wine & Cheese Gallery does a nice job of using Twitter to post their weekly menu link, talk about upcoming tastings, and generally have a good time talking with other foodies on Twitter. I think a great example of a local restaurant effectively using Twitter is the Loveless Cafe outside of Nashville (the personality of the place really comes through on their tweets. It doesn't hurt that they have killer biscuits and jam!). It was on our visit to Nashville a few years ago that we learned about a "meat and three" (sort of a blue plate special - your choice of meat and three veggie side dishes). The Satchblog of local Satchel's Pizza fame is also worth checking out. His blog certainly captures the highs and lows of being an independent restaurateur and is indeed "where Satchels ramble" (in a good way!). Do you know of any other local Gainesville restaurants with a Twitter feed or a lively blog? Post in the comments below or drop me a line. p.s. Unfortunately, I take back most of what I said positive about the Too Jay's here in Gainesville when it opened. Every time we've been back since our first visit it seems a little more lackluster (generally mediocre food and I-don't-really-care service attitude). On the other hand, speaking of chains, we recently tried the local BJ's Restaurant Brewhouse with friends and had a pretty good experience. This past Friday, we decided to check out Chopstix Cafe on 13th Street for dinner. A recent search I had done indicated that Chopstix was the hands-down favorite Asian restaurant in town. The restaurant is located right on the bank of Bivens Lake, which provides a great lakeside view from the main dining room. The "Pan Asian" menu is huge and has pretty much any Asian dish you can imagine. We ordered chicken satay as an appetizer. We're used to chicken satay being served on skewers and often with a small flame. Chopstix's satay came in a bowl filled with small chicken chunks covered in a tasty sauce. For our main course, I ordered "The King and I" (Thai-style spicy shrimp with vegetables) and Traci went with the pepper chicken with green peppers and onions. Both dishes were nicely done and reasonably priced. For that matter, the prices on everything were lower than I had expected. My only minor complaints was that the service, while friendly, was slow and it also felt warm and muggy at our table. I realize this was partially because we were sitting near the window and the sun was going down, but the place could also stand to crank up the A/C a bit. I'm not one to generally complain about the temperature in a restaurant. Overall, though, we had an enjoyable experience and will be back. On Saturday evening, we decided to check out Cedar Key and ended up at Frog's Landing, a casual seafood restaurant on the water, for dinner. Service tried hard to please, but was very slow and short-handed. The food was respectable for a seafood joint. I ordered one of the specials, a soft shell crab sandwich and Traci had a burger. Frog's own "Deep Croak" pepper sauce was a nice surprise. 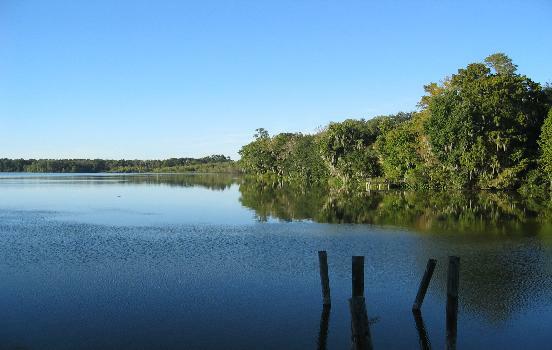 We're looking forward to exploring Cedar Key more in the future. My first impression of Cedar Key is that this funky, little fishing village is how Key West must have been decades ago before it was over-commercialized. Cedar Key is a mix of independent restaurants, motels/rentals and art shops. We also had the chance to check out Wise's Drug Store downtown on University for lunch one day this past week. Now, we like nostalgic, old-time places, and I'm glad we checked Wise's out, but we probably wouldn't go back for lunch. We sat up at the counter and both ordered turkey salad sandwiches and a bag of chips. For dessert, we split an old-fashioned shake, which Gainesville.com had highlighted. The sandwiches were small and for $4.25 each not my idea of a good deal. The shake was fine, but not outstanding. Service was friendly and we did enjoy taking in the history of the place. I believe the soda fountain portion of Wise's is only open in the late morning and during lunch time. Otherwise, I'd say this would be a good place to grab a shake in the evening. Still, I'm glad we checked Wise's out. Bottom-line: We certainly found a new restaurant to add to our "restaurant rotation" in Chopstix Cafe. Cedar Key was a nice surprise and Frog's Landing was overall a solid experience. While Wise's was a little bit of a let-down for lunch, I'd still encourage you to check out this slice of Gainesville history. On Friday night, we decided to head across the bay for a change and visit downtown St. Pete. We decided on having dinner at Dan Marino's Fine Food & Spirits in BayWalk. We had eaten or had drinks at Dan Marino's a few times before, but hadn't been back in maybe a year. Previous visits had been positive , but not the kind of knock-out experiences where we were in a rush to return. When we arrived last Friday night we were told that there was about a 20 minute wait for a table. Being impatient, we checked out the bar area of the restaurant, found an open high-top table, and sat down. Next, we watched two servers walk past us and not say hello or offer us a menu. After several minutes, one of these servers finally returned, took our drinks orders and offered us menus. For a starter, we ordered a spinach and three cheese dip with tortillas. For my main course, I went with a grilled steak salad and Traci picked a turkey burger. The spinach dip was tasty and my salad was solid (nice slices of steak). As for Traci's burger, it was Asian themed and came with a dipping sauce she didn't like and an Asian salad on top of the burger that she wasn't a fan of either. I had a few bites and thought the burger, once it was stripped of Asian accouterments, was pretty good. As we began our meal, the guy at the table next to us returned his order of "Dan's Meatloaf", saying that that it tasted like "a pack of spices from the grocery store that hadn't been mixed well." Fortunately, our meal wasn't that bad, but overall it was a mediocre experience. Service was lackluster and the meal was just average. I realize that, by choosing to sit in the bar area instead of the dining area, we didn't get the full experience (we've done this before and the service was better). Still, our latest visit to Dan Marino's was a reminder of why we tend to avoid eating at BayWalk. I still think Dan Marino's, particularly the outside balcony area, is a good spot for drinks. There are other Dan Marino's restaurant locations in Las Vegas and Miami, with the Orlando location scheduled to reportedly re-open in "mid 2007." The original Dan Marino's locations in Coral Springs and Fort Lauderdale both apparently closed. The St. Pete location appears to do pretty good business, but one never knows. It's unclear to me how involved (or uninvolved) the Hall of Fame quarterback and NutriSystem pitchman is these days in the restaurants that bear his name. The Dan Marino's St. Pete location also came in fairly average on its last health inspection report. As for BayWalk, the food selection on the second floor besides Marino's includes: a location of TooJay's Deli (a generally good lunch choice), Gratzzi's (an Italian place that I've never heard much about), Tokyo Sushi Cafe (went once and thought it was okay). There is a new little Italian place downstairs with pizzas and salads (we stopped after dinner there Friday night for gelato) and a Johnny Rockets location is still next to it. Finally, Dish, a sort of make-you-own stir fry restaurant concept that I could never get into, closed its BayWalk and Centro Ybor locations recently. 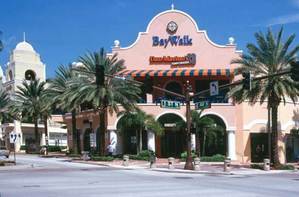 Bottom-line: Dan Marino's at BayWalk is a good choice for drinks and appetizers, particularly if you can sit in the outside balcony area. As for dinner, there's better choices in downtown St. Pete. Inspection Scorecard: Last Inspection: March 2007 violations - Critical (7), Non-Critical (0). On Monday, Traci and I had a chance to try out Marc and Didi Zudar's Deli Cafe for lunch. We had never been before, but knew that the long-time local restaurant family is known for their cakes and sandwiches. This Zudar's is not to be confused with the since closed Zudar's Deli Cafe location near SoHo, which the couple had previously sold and then allowed the new owner to use the name. Marc and Didi Zudar's Deli Cafe is located in a small nondescript building on W. Platt St. next to the Publix at Platt and Bayshore and a few doors down from the Irish bar Four Green Fields (best known for its authentic thatched roof). We arrived a little after noon at Zudar's on Monday and the place was crowded with the lunch rush. We were lucky to grab a table for two soon after walking in. There was a number of items on the menu I wanted to try, several soups and quiches sounded interesting, but I ultimately decided upon ordering a sandwich called "the Meltdown" - roast beef, bacon, provolone, lettuce and tomato on whole wheat. Traci ordered a traditional BLT on white. Our server was quick and relatively friendly considering that she was covering countless tables. While my sandwich wasn't Wright's Gourmet House caliber (still my favorite local sandwich spot), it was very good. Traci also enjoyed her BLT (notice the bacon, no chicken!). We'll likely drop into Zudar's again sometime as I want to try out their freshly made soups and their cakes look killer. Two of the tables around us each ordered a slice of the coconut cream pie to share. These were the kind of big slices that look like they would put you to sleep after returning to the office. My only gripe with my sandwich was that Zudar's uses shredded lettuce which I'm not a fan of. Also, while my sandwich was a good size, and for the price (about $16 for the two of us with drinks) it was a fair deal, it wasn't particularly "overstuffed" either. Finally, while the sandwich is what really matters, the included bag of plain chips was small and the pickle slice was even smaller. Other local delis that we like for sandwiches, besides the fore mentioned Wright's, includes Castellano & Pizzo, Mazarro's Italian Market, Schiller's German Delicatessen, and Interbay Meat Market. We still plan to give Mott & Hester Deli a try one of these days. We've also done Pane Rustica before for dinner, but not lunch. What good local sandwich places am I forgetting? In case you were wondering, there aren't any recent health inspection reports on Zudar's available. Bottom-line: Zudar's may not have the best sandwiches in town (I still think Wright's is top of the heap, although I know some of you think Wright's is overrated), but you could definitely do a lot worse. A good lunch choice if you work in or around downtown Tampa. Continuing our quest to find the best sandwich shop in the Bay, we headed over to Mazzaro's Italian Market on 22nd Ave. in St. Pete for lunch this past Saturday. Why I've lived in Tampa for a year and a half now, and haven't been to Mazzaro's before now is beyond me. I thought Castellano & Pizzo Italian Foods on Henderson in Tampa was a great place, and it is, but the much larger Mazzaro's is in a class by itself. After fighting through the Saturday afternoon crowds to check out Mazzaro's many aisles of Italian foods, including a huge wine and cheese selection, and every other goodie imaginable, we got in line at the deli. Traci decided upon a meatball sandwich (peer pressure from Sticks readers? Just kidding). I went with a muffuletta sandwich, as I was curious to taste what Mazzaro's version of a muffuletta was like. The muffuletta is an Italian sandwich that was invented in New Orleans, which is where I grew up. The deli guy serving us cautioned that the Mazzaro's version of the sandwich wasn't served on real muffuletta bread (a large round loaf of Italian bread), but assured me that it was still very good. After enjoying peering in the deli cases at all sorts of prepared dishes while we waited for our sandwiches to be made, we took our sandwiches outside to the back patio. My sandwich was huge and tasty, but really shouldn't have been called a muffuletta. Not only was the bread different, but it didn't have enough olive salad on it. That said, it was very good. Traci loved her meatball sub and let me try a few bites of the sloppy goodness. It was dripping with sauce and the meatballs themselves were great. Both sandwiches were only five bucks each and we had to take half home. After passing the bakery and dessert section of Mazarro's, we couldn't pass up the home-made gelato (Italian ice cream). We were tempted to just keep trying samples, as they were all so good, but we finally decided upon a small cup of banana caramel for me and pistachio for Traci. Both were delicious and I think stopping for a "gelato break" may be a requirement for all future visits. A small gelato is only two bucks. 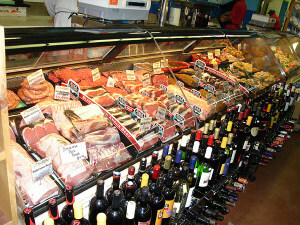 There is also a gourmet coffee bar area and a butcher and produce area in the front of the store. We definitely plan to visit again and spend more time exploring the store, hopefully when it's not so jammed. If there is one downside to the place, it's that it was packed when we visited. This doesn't look like a place that you can get in and out of quickly. All of the employees we encountered, though, were friendly and helpful. Given the uniqueness of the place, I can certainly understand the crowds and it's great to see such strong support for a local business. 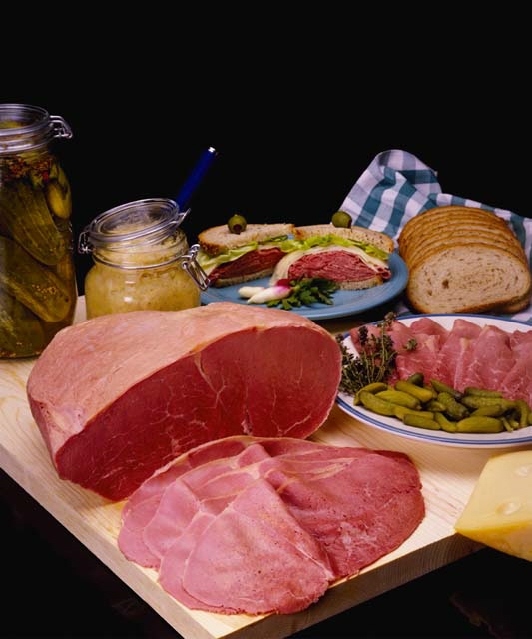 Bottom-line: Whether you're in the mood for huge, fresh sandwiches from the deli, delicious pastries or gelato from the bakery, or a grocery full of imported foods, there's seemingly something for everyone at Mazzaro's. The only downside I found was navigating the crowds and the lines. This past Saturday, we had planned on having lunch at Wright's Gourmet, but after walking up and seeing the line to the door, we switched to a back-up plan. A friend of Traci's had told her about a little German deli on Manhattan so off we went in search of it. A few minutes later we came upon the fore-mentioned deli, Schiller's German Delicatessen, at the corner of Manhattan and El Prado. 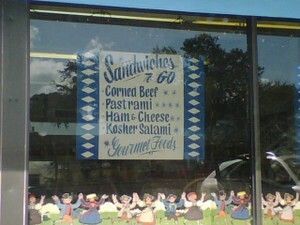 It turns out that Schiller's is one of the oldest delis in Tampa. 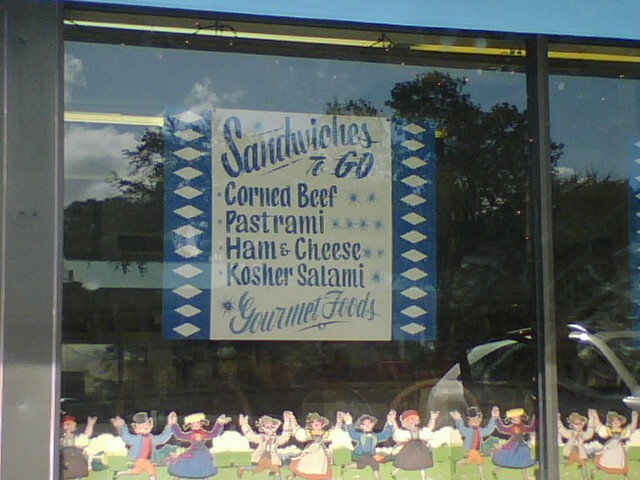 The deli was opened by the Schiller family in 1952 and has been owned and operated by the Trunk family for the past twenty-three years. There are a few shelves of German foods and a German beer section in the back of Schiller's, but the main attraction at the little place is clearly the deli and its long list of German sandwiches. I decided to give the trademark Schiller sandwich a try- piled with meats, cheeses and cole slaw on rye - and Traci decided upon a turkey sandwich on an onion roll. I also ordered a side of cole slaw. We sat at one of the handful of tables and both enjoyed our sandwiches. Traci said it felt like we were eating a sandwich in grandma's kitchen and I couldn't agree more. Everyone was friendly. On the way out, we noticed that Schiller's also offers a lunch plate special, which includes your choice of two different types of sausages, and also offers all-beef hot dogs. Schiller's is also open for breakfast. While the sandwiches weren't as big as what you'll get at Wright's, they were tasty and cost a few bucks less. I hate lines so not having to wait forever was a big plus as well. We'll definitely be adding Schiller's to our list of local sandwich joints that we visit. While my favorite remains Wright's, Schiller's has its own charm and is a good second choice, as is Italian market and deli Castellano & Pizzo down the road on Manhattan. The no-frills Interbay Meat Market, south of Gandy (SOG) on Interbay and MacDill, also turns out good, hefty-sized sandwiches. Three other local sandwich shops I have on my list to try out in the coming months includes Zudar's on Platt near Bayshore Blvd, Mott & Hester Deli on Dale Mabry, tucked into a strip center almost across the street from Wright's, and the well-known Mazzaro's Italian Grocery on 22nd St. in St. Pete. What places am I missing? What's your favorite local sandwich joint and why? Bottom-line: The next time you're faced with a long line at Wright's, consider heading over to Schiller's German deli for tasty sandwiches in a homey setting. You'll save a few bucks, too. After watching USF thump Pitt at RayJay on Saturday, we stopped at Wild Oats on N. Dale Mabry for a late lunch. If you've never been to a Wild Oats before, it's similiar to a Whole Foods. If you've never been to either before, you're missing out. I'm not a greenie or granola-type and I dig 'em. One of my favorite things about Wild Oats and Whole Foods is that they both have big selections of freshly prepared grab-&-go foods. All different kinds of stuff. The new Wild Oats on Dale Mabry has a cafe section, which makes various coffees and smoothies. There's also a big salad bar, and a deli that makes sandwiches and salads. Other cafe sections includes a soup area, sushi area, pizza area and an area that features more traditional meat-and-potatoes dinner items with a twist. On this visit, instead of hitting the big s alad bar, I decided to try some sushi and a bowl of soup, while Traci stuck with her favorite from the deli, a chicken meatball sub. Their deli sandwiches may not be Wright's or Castellano & Pizzo quality, but they're good. There were four of five soups to choose from. I picked a Hungarian mushroom soup. For sushi, I picked up some spicy shrimp rolls. One big problem we've had in the past at Wild Oats is clueless service from the checkout people in the cafe section at Wild Oats, which ruins the experience. On our first visit one evening after the store had first opened, the cafe checkout was closed and we had to wait with our food in hand at one of the main checkout lines. Then we had to re-enter the store so we could sit in the cafe section. On another visit, we stood holding our food at the checkout register and were ignored for several minutes before we were asked if we needed help. No, we're standing here with food for fun. Thankfully, on our visit this past Saturday, the service in ordering our lunch and checking out was pleasant and prompt. The cafe seating area was also clean and didn't look disheveled as it has on a previous visit. Traci enjoyed her sub and I liked my soup. Unfortunately, the sushi tasted mediocre, which was probably because Wild Oats uses brown rice - not what I expect for my sushi. While we have a love-hate relationship with the service at Wild Oats, more times than not, we've been pleased with the food, the prices are fairly reasonable, and the place is convenient for us. 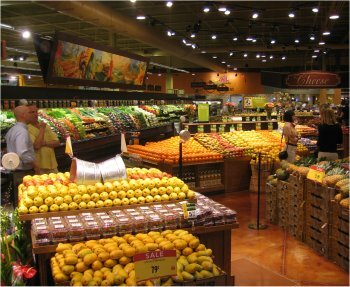 On a related note, we also recently checked out the new Fresh Market store at the corner of Henderson and Dale Mabry. It's a smaller version of Whole Foods and Wild Oats with an emphasis on fresh products (big produce section, meat and seafood department, and a cool looking rotisserie chicken area, if you can use cool to describe rotisserie) as the name implies. Fresh Market is worth checking out next time you're in the area. Now why is the closest Whole Foods still in Sarasota? Bottom-line: If you've never checked out a Whole Foods, Wild Oats or Fresh Market store before, you're missing out. The deli and grab-&-go meals are pretty good, just be prepared for unpredictable service. Thanks to a recommendation by a reader, we decided to try out Castellano & Pizzo Italian Gourmet Foods on Henderson Blvd. in south Tampa this past weekend. 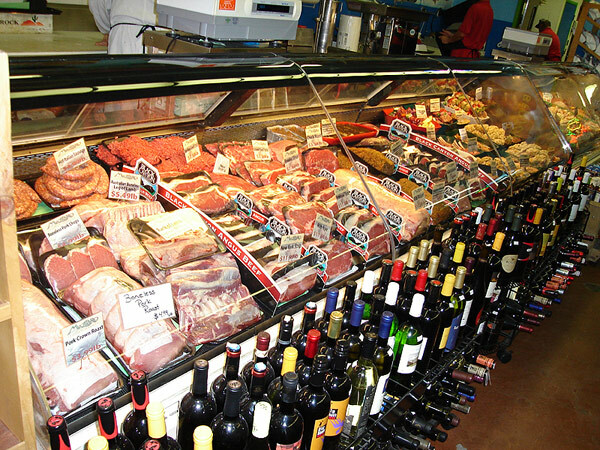 Castellano & Pizzo is the most authentic Italian market and deli I've come across in Tampa. We stopped in for sandwiches, but also ended up checking out the wine, cheese, produce, meat and fresh prepared-food sections. Traci decided on a classic chicken parmesan sandwich and, instead of ordering a traditional Italian sandwich or Cuban, I went with the "salmon delight" sandwich. This ended up being good decisions on both counts. My sandwich - a combination of smoked salmon with sliced tomatoes, delicious big slices of mozzarella, oil and lettuce - was very tasty. Traci liked her chicken parm. The sandwiches at Castellano & Pizzo are big and reasonable priced. Service was a little slow, but very friendly. I couldn't help but order a small side of prosciutto salad (sort of an Italian meatlover's salad), while we waited for our sandwiches to be made. I also ordered a small side of stuffed green peppers after another customer gazed into the deli case and raved about them to us. I could have easily made a meal out of sampling the many freshly-prepared salads, olives, peppers, you name it in their case. The prosciutto salad and the stuffed peppers (filled with meat, cheese, etc.) were both excellent. I still give the nod to Wright's Gourmet House for being my favorite sandwich shop in Tampa, partly because Wright's has a bigger selection of sandwiches and more salads to choose from. Plus, that's all they do. However, my experience with Castellano & Pizzo this past weekend was very positive. Anyone that has never stopped in before is missing out. We had fun just exploring the store. Tampa is fortunate to still have an independent Italian market of the quality of Castellano & Pizzo. In doing a quick Google search on Castellano & Pizzo, I found they are offering a four-week class on Italian language, cuisine and culture. Includes dinner with each class. $205. For more information. Bottom-line: Wright's remains my favorite sandwich joint in Tampa, but the deli at Castellano & Pizzo is a strong number two. 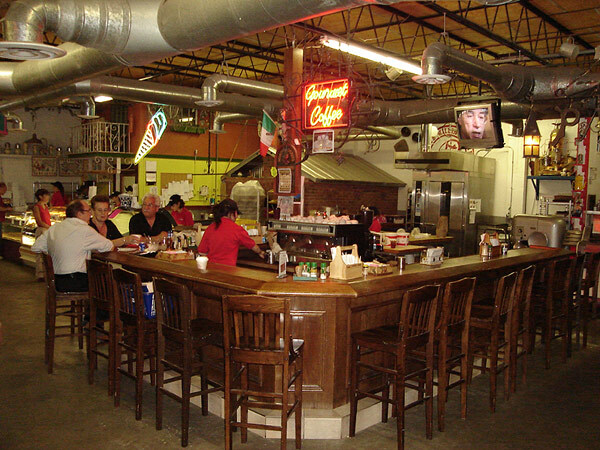 This gourmet Italian market offers up tasty sandwiches and a wide selection of freshly-prepared Italian dishes to-go.